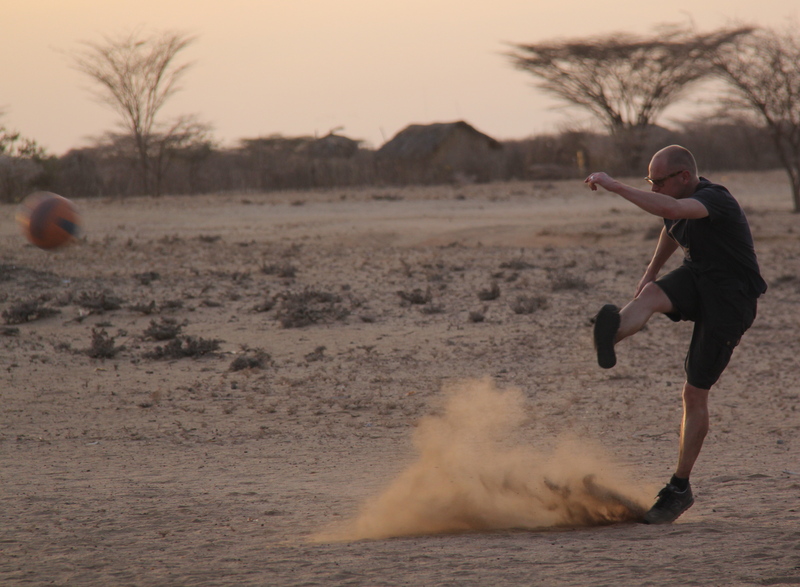 It’s the little things that will make you worry when you sign up for something like the Turkana Basin Field School. Most of this blog has documented the stuff that might be expected. 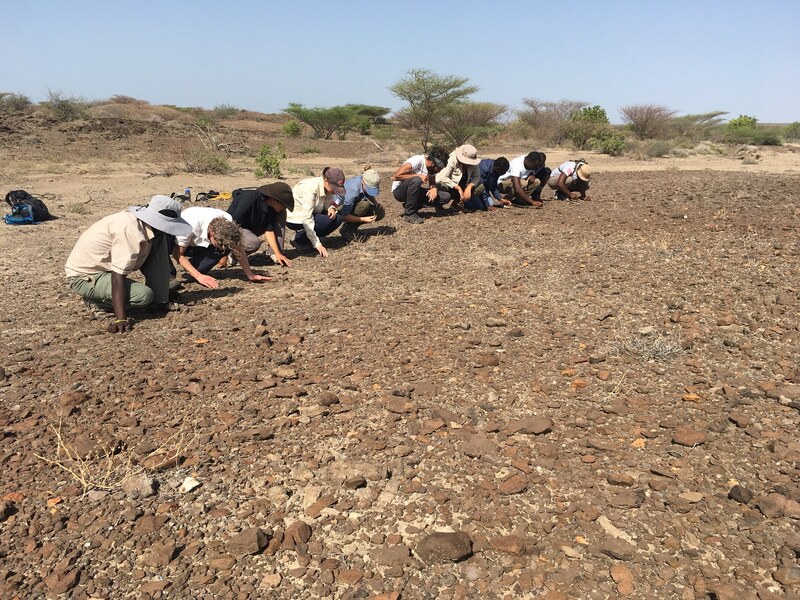 You sign up for a semester studying human evolution in Kenya and you hike through the desert, see a few zebra, pet a few goats, and generally get your hands dirty. But what happens when there’s down time? What will home look like for ten weeks? 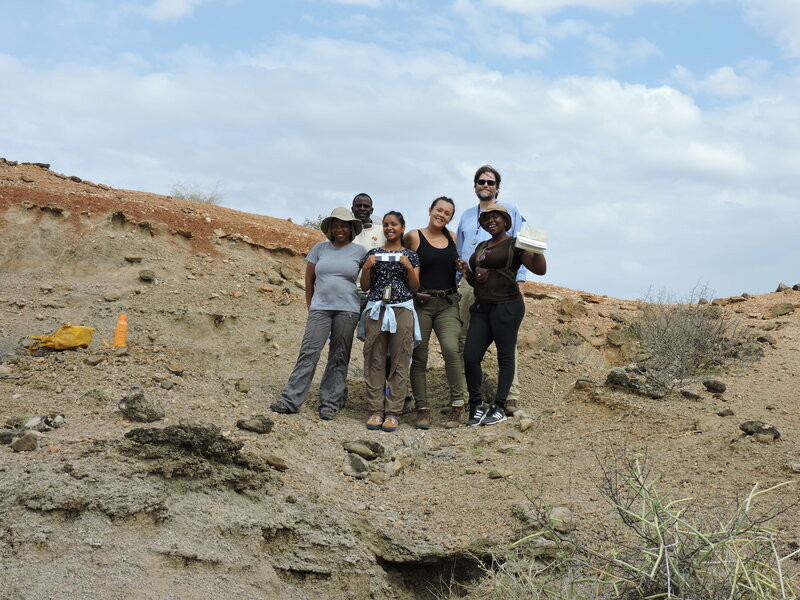 In the break between the archaeology and paleontology module, I’d like to take you on a quick stroll around TBI before diving into the vertebrate fossil record of the Turkana Basin with Dr. Mikael Fortelius. Richard Leakey meets with the students to discuss the recent Kenyan elections and the tumultuous history of Kenyan political history. 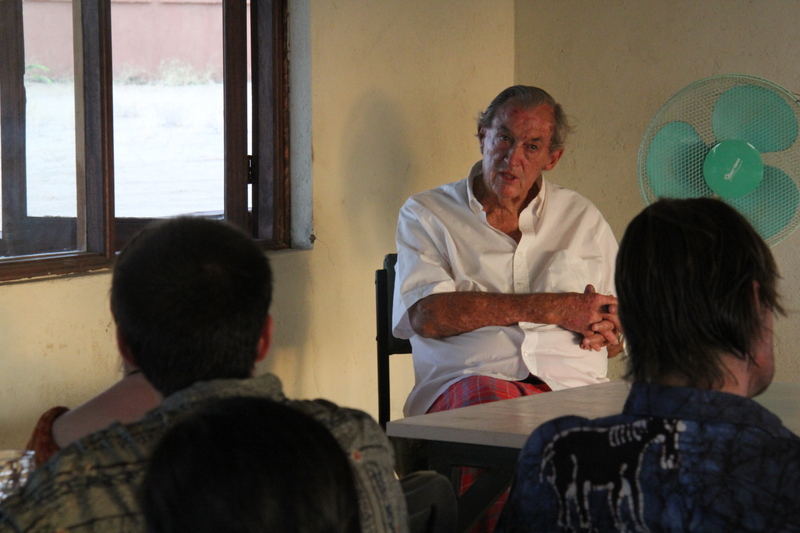 Most of us were familiar with Dr. Leakey's scientific career but here we had the rare opportunity to hear about his political career and insights gleaned for years of serving his country. The Turkana Basin Institute South Turkwel campus sits on a high bluff overlooking a bend in the Turkwel River. The compound was constructed by the Institute in 2008 to create a base of operations for field workers interested in the rocks on the west side of the lake. 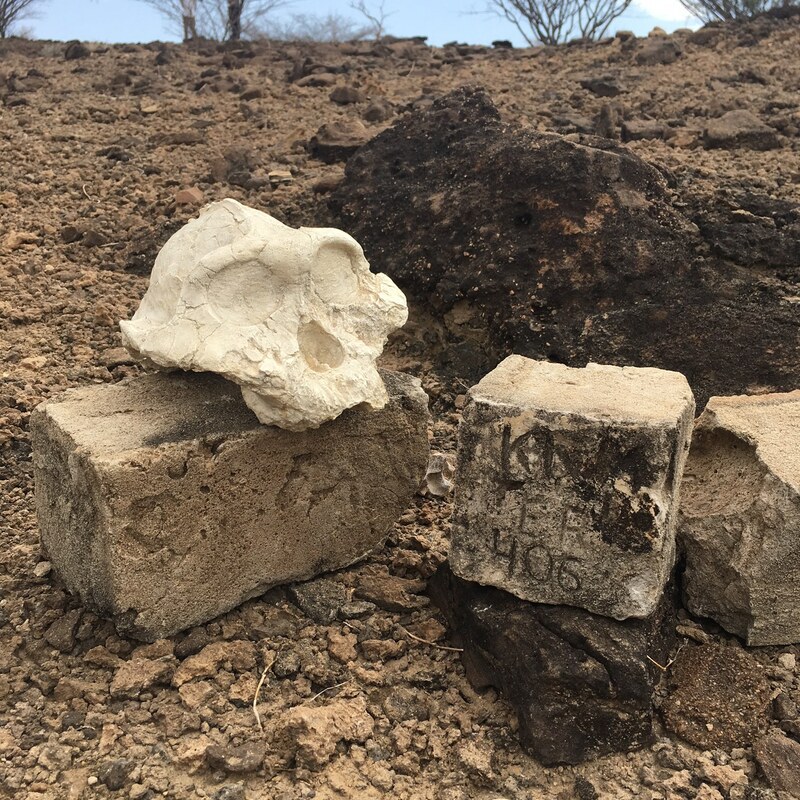 The concept has been in full force for decades on the east side of the lake a permanent camp has hosted years of Leakey-led research into the Koobi Fora outcrops that have yielded early human ancestors such as Homo rudolfensis. Illeret is in the midst of an expansion to facilitate exploration on the east side of Lake Turkana. The view from the mess hall as the sun starts to set. To the left is rolling Plio-Plestocene outcrop. 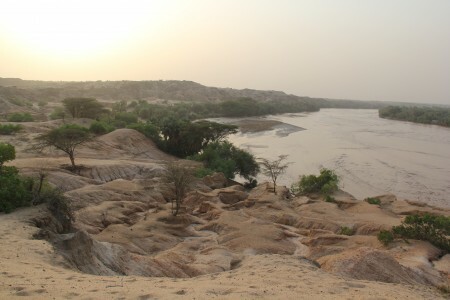 To the right, the Turkwel River, the source of TBI's plentiful water and plentiful recreational opportunities, continues its course East. 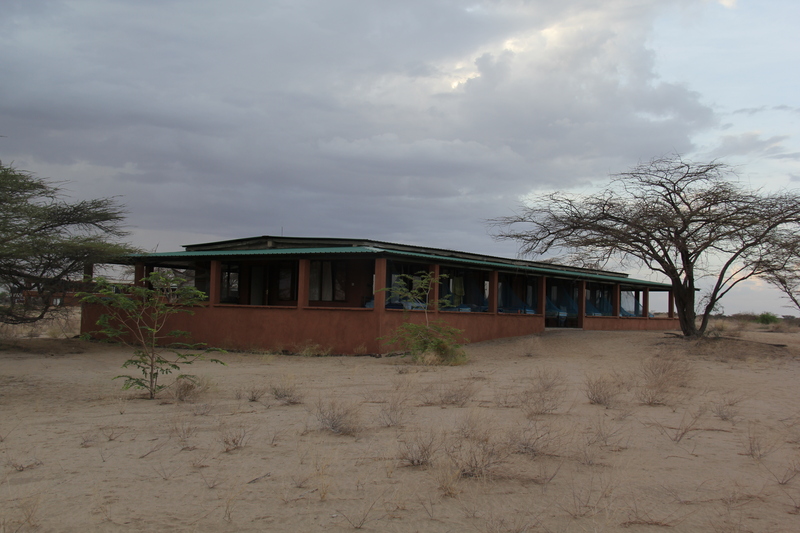 But back to the Turkwel tour: As a student, there are three main buildings to care about: the mess hall where you eat, the dorms or cottages where you sleep, and the classroom where you contextualize the field excursions we take in the Turkana Basin. Sunrise and moonset over the TBI mess hall. The mess hall is at the far end of campus and it overlooks a series of Plio-Pleistocene badlands that brilliantly reflect the sunrise each morning and showcase the sunset. 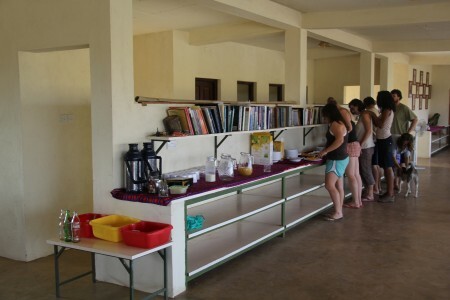 The field school students have their own tables at one end of the mess where coffee and tea are always ready to be brewed or mixed. One popular question asked by people who learn you’re going to be living in the northern deserts of Kenya is, “What will you eat?” We’ve learned the answer: you eat well. Sunday morning breakfast queue. 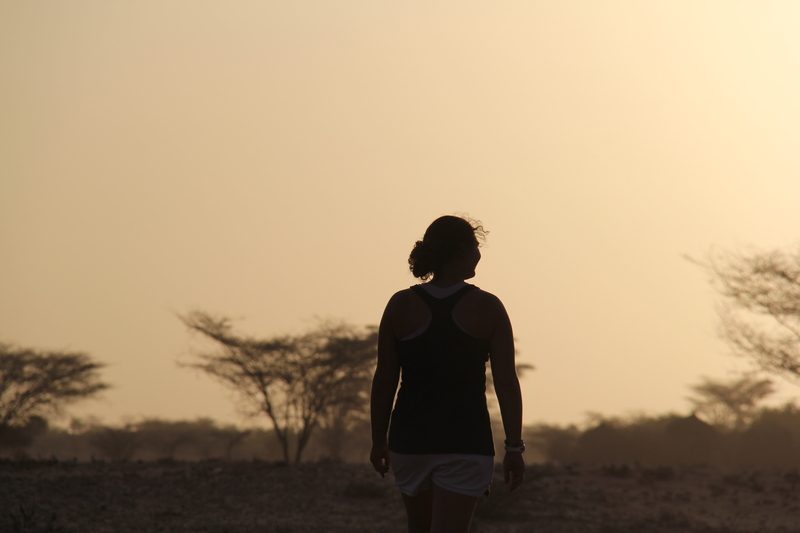 Leanna leads the pack after a long run along the loose, sandy track leading away from camp towards Lodwar. Note the TBI library with it’s eclectic selection ranging from classic volumes on Olduvai Gorge to Bill Bryson memoirs. I brought plenty to read, but have decided to take care of this library while I have the chance. Breakfasts are oatmeal, toast, peanut butter, jelly, butter, and juice. Occasionally scrambled eggs, seasoned sausage, or bacon are added to the menu along with freshly made doughnuts. 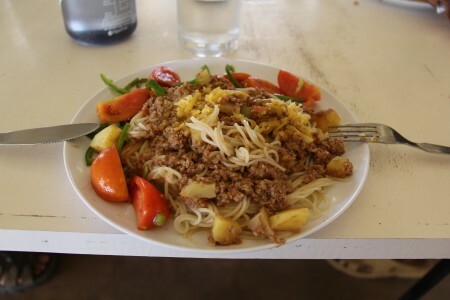 Lunch is rice and pasta with different options for pouring over the rice each day including lentils, beef Bolognese or small, freash rolls that can be decorated with meat, cheese, and peanut butter along with fresh salad and watermelon. Dinner is rice or potatoes – fried, cubed, or mashed – with goat, beef steaks (perfectly cooked), oxtail stew, seasoned chicken, or fish. The course is always paired with a cooked vegetable and a fruit or cake for desert. Again, we eat really well with an incredible view of fossiliferous outcrop to boot. In case you wanted to see a shot of our food, here it is. Very tasty stuff. This meal always makes me hanker for Cincinnati-style chili. This is a good thing. 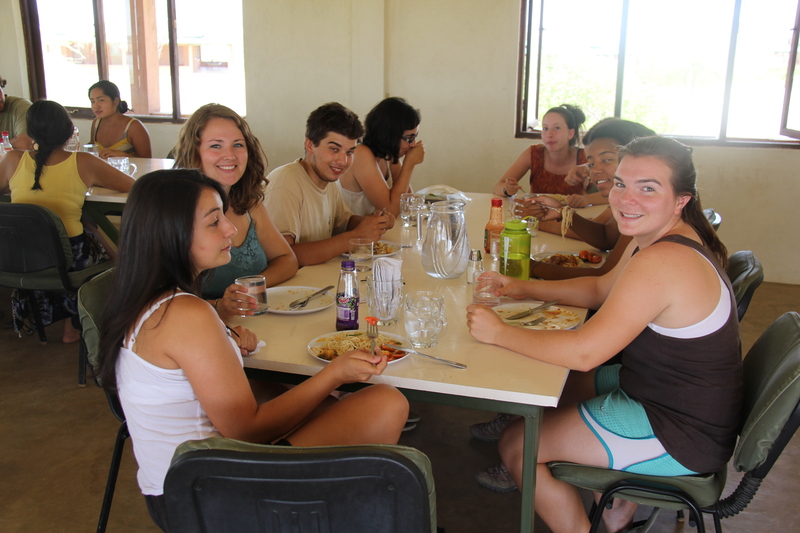 Maegan, Rosie, Tim, Ashley, Rachel, Ana, and Leanna enjoying lunch on a lazy Sunday off from the weekly grind of coursework. From the mess hall it’s a slightly steep, sliding stroll through the sand to the edge of the river where the students can blow off a little steam as the sun dips below the horizon. We’ve gotten better at carefully placing our feet to avoid the ever-present spikes and spines carried along by the water. Sometimes a trip to the river just involves soaking in the shallow pools and channels of the Turkwel surrounded by local children curious to see new people. Often a football makes an appearance to throw around in the water, but the official pastime of the field school on a weekday evening is Doum Ball. Rob demonstrates proper Doumball technique as he swings for the fences...or the acacias. 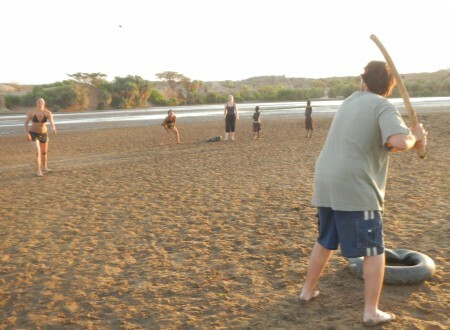 The game was invented when Rob found a large stick in the channel of the winding Turkwel. Nearby was a doum palm nut, the oblong fruit whose rind is gnawed on or broken off by the Turkana as a sweet snack. “I think this might be something.” He tossed the nut to himself and swung. A game was born and the Turkwel Slugger quickly shaped into a bat that Francis, John, and Rob use to crank doum palm seeds across the river. 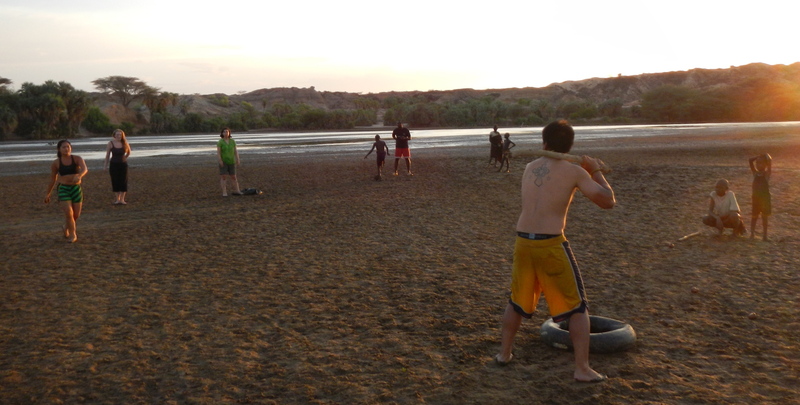 John squares up the plate (or the inner tube) as Cory lobs a doum palm nut down the center. Chances are he cranked this deep into the Turkwel River. Holly takes the lead off first and focuses on keeping her footing on the treacherous second baseline. 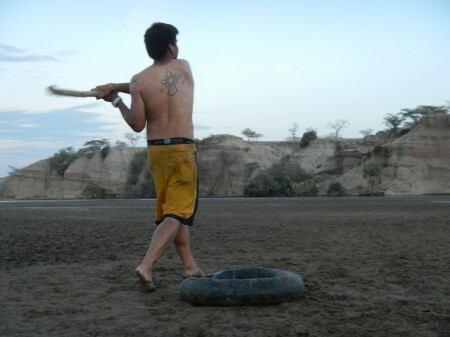 Doum Palm Ball is a like baseball except with two bases and home, all marked by patched Land Rover inner tubes (it’s in the rule book). Everyone gets three swings at the nut when they’re up to bat and there’s no such thing as a foul ball. Run on anything…if you can. 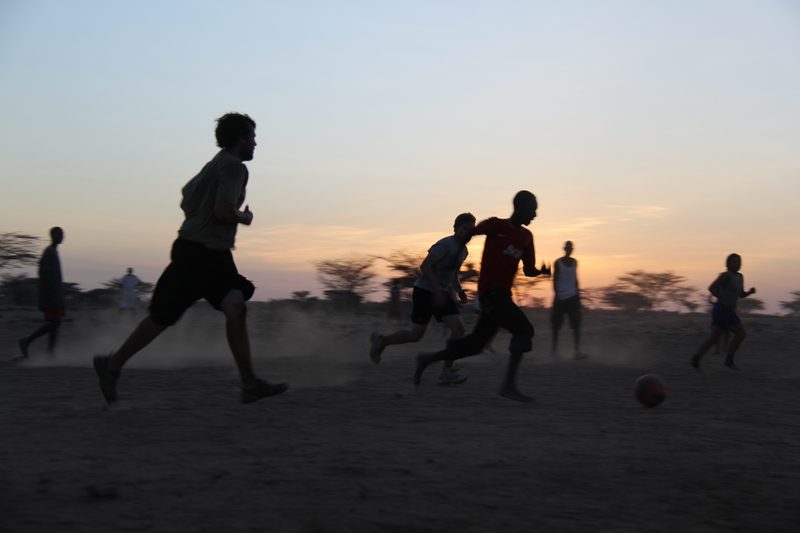 One of the key hazards of doum ball is the muddy field provided by the meandering Turkwel. Slipping and sliding from first to second and driving for home is a battle against gravity and the crazy angles the doum palm seed can fly off as it wobbles through the air. Holly is on the mound (or the pit) as Rob stares her down with his Turkwel Slugger. 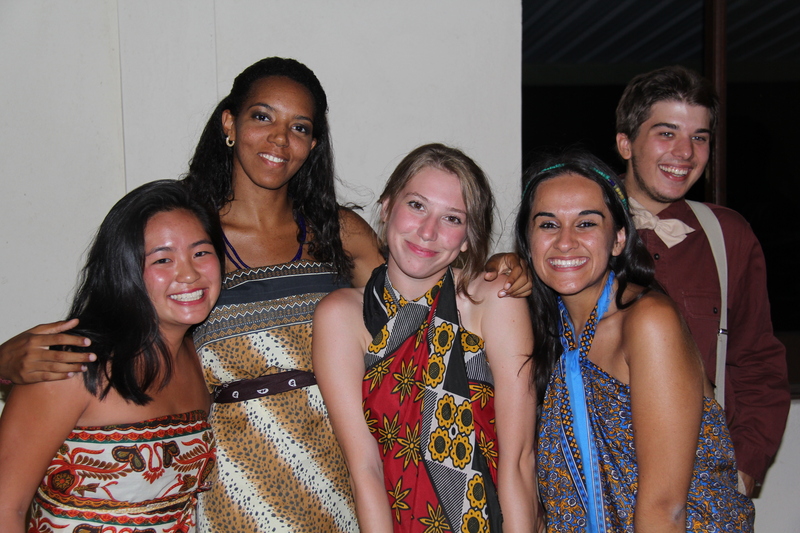 Ashley celebrated her birthday with her first doum ball game. 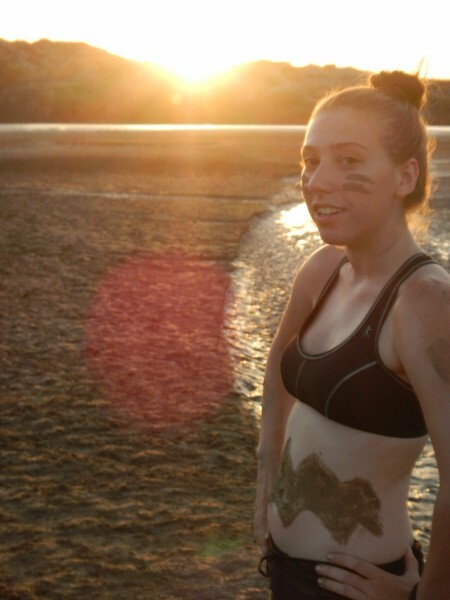 She singled and waits for Rob to bring her home…through a lot of mud. Bottom of the final inning (determined when the players can hardly see the doumball anymore). The Artiodactyl Ponies are down by two. Bases loaded with Ashley taunting from first and Sam’s lead off second blocked by Meg defending the route home. Rob steps up to the tube. 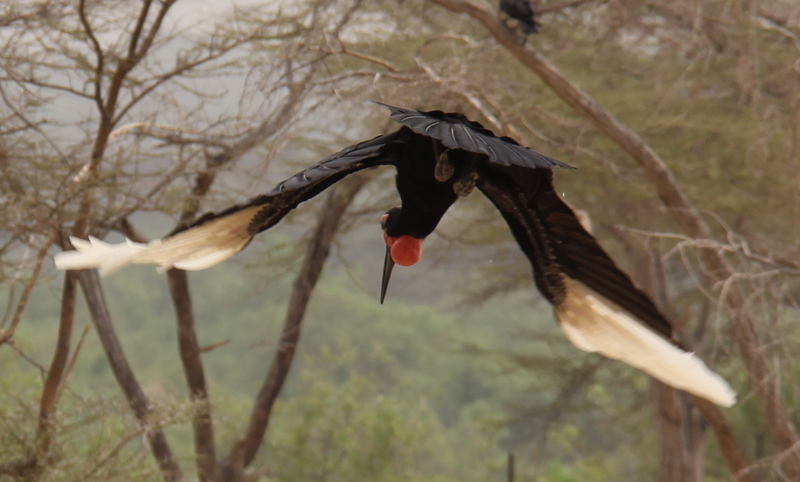 He’s been cranking them across the mud to a meandering channel of the Turkwel. Near perfect average. RBI through the roof (the corrugated metal roof). He could bring this thing home. Visions of a celebratory hometube mudslide flit through his head. Borths is on the mound (or pit as the muddy case may be). One, two strikes. Loaded count. The ball is almost indiscernible in the twilight. The doum nut is lobbed. Rob puts everything into the swing. Contact. The doum palm rockets straight up. A pop fly that drifts behind the home inner tube. Rosie, the catcher, is up and calls it. As she scrambles for the doumball she wades into the slipperiest mud on the field, right behind home. Her feet go out from under her and she slams into the muck, her muddy uniform keeping her camouflaged in the mire. Somehow she keeps her eye on the prize and snags the doumball from midair in mid slide. The crowd goes wild. Bailew models her doum palm ball uniform, bringing together a little Chuck Schultz and a little Louis L’Amour. Students have also found drier ways to keep moving. 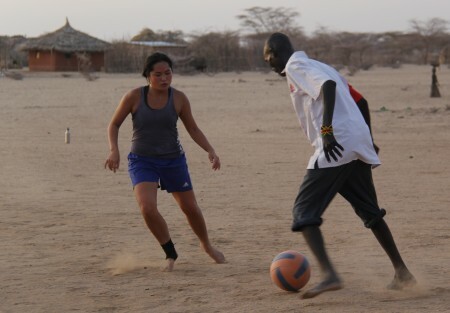 Some, like Leanna, take advantage of the sandy roads to try to get a little Kenyan magic into their running routine. The quiet platform by the mess has become a gathering place for yoga enthusiasts such as Holly, Cory, Eve, and Rob. Holly reads on the mess hall veranda while Cory stakes out a spot on the stargazing/yoga platform before breakfast arrives on a lazy Sunday morning. In case you hadn’t noticed from previous pictures, we have a few more women on the field school than men. 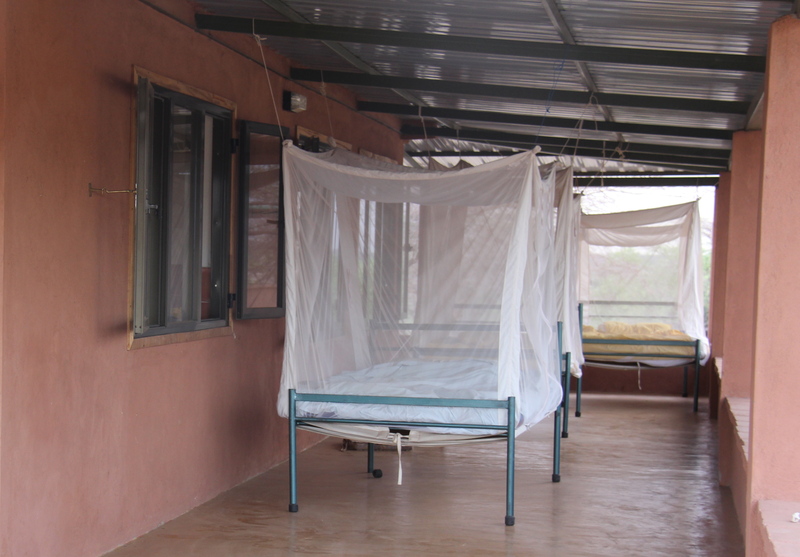 The dormitory, set close to the mess hall, is where the female students can crash beneath their mosquito nets while the men share a cottage opposite the dorm. There are five other cottages along the row that are used by visitors including our module professor, researchers curating their discoveries, and visitors passing through the area. In a new cottage in Kenya all covered in Indigofera lived fifteen paleoanthropologists in two straight lines...The cots line the veranda with rooms for personal affects and restrooms along the hall down the middle. Shrouded in a mosquito net and catching the cross-breeze, I probably get better sleep at TBI than I do at home as I wake up to the morning chorus of birds and a rooster who actually crows at dawn. 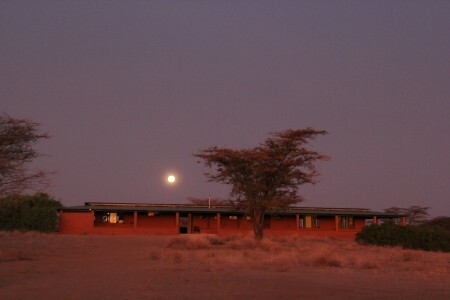 Past the cottages and across the compound from the mess is the classroom building, named in honor of legendary fossil hunter Kamoya Kimeu, where students attend lectures, work on TBI netbooks in the computer lab, catalog specimens, work on independent research projects, and generally concentrate on academics. The classroom building is appropriately situated next to the large research building that houses material collected from around the basin by TBI researchers. The three story research building in the background has the fossil preparation labs, osteology collection, workspaces for visiting researchers, and a rooftop space for special occasions. 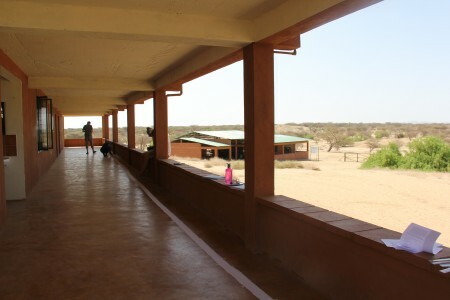 The classroom building in the foreground is where the students spend most of the day in camp either in class or in the computer lab. 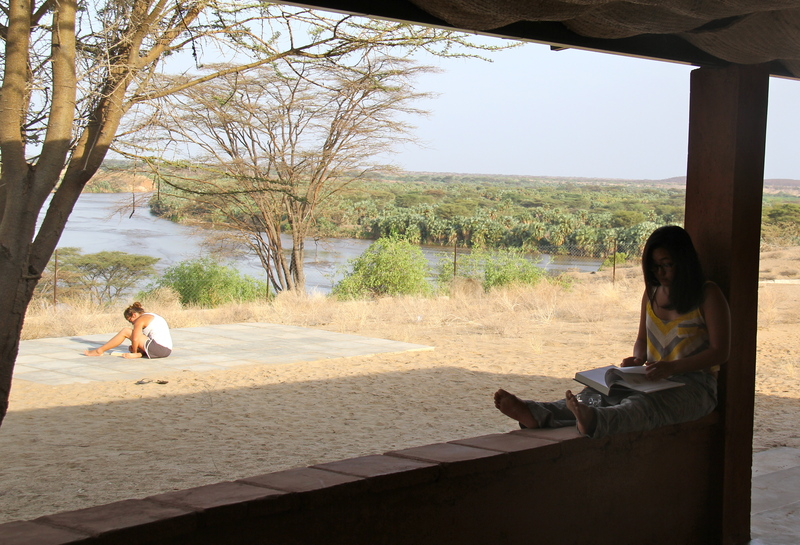 Every structure on the compound was designed by Richard Leakey with plenty of windows to capture the Turkana breeze and a looping veranda around every structure provides plenty of shaded spaces during the heat of the day. The beds in the cottages and dormitory are actually set up on the verandas with mosquito nets attached to the rafters. Every night as I drift off, I can watch the stars through the acacia by the guys’ cottage. The veranda looping the research building acted as a staging ground for our toilet paper geological timelines, but more on that when we get to vertebrate paleontology. For now, note the open, breezy design of every green-roofed building at TBI. For anyone curious about the climate in the hottest place on Earth, unlike most deserts I’ve visited, the temperature doesn’t really drop at night. Rather than becoming cool, it just becomes less hot. But everyone has acclimatized to the heat by drinking water constantly and getting used to constant sweating. The weather is part of the experience, though today we were treated to a cloudy day with sporadic drizzle. Everyone has been feeling a little off, simply because we got used to the clear skies and heat. Mid-March roiling sky over TBI. 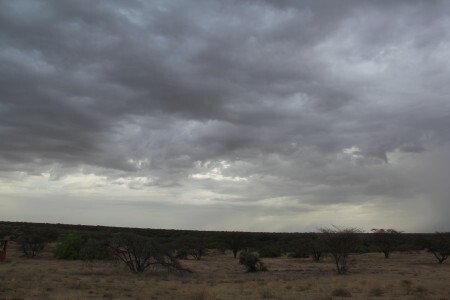 Cloud cover is a very rare sight in the Turkana Basin. During class the rain started to pound the sheet metal roof and the students were dismissed to frolic. Once everyone got out in the drizzle to dance, we discovered the metal roof really magnified the sound of the light drizzle. Rain dancers from left to right: Ashley, Acacia, Rosie, Poppy (camp dog), Eve, Cory, and Meg. Walking back to the compound from the direction of the fish ponds with the multistory research building on the far left, the classroom directly ahead, one of the cottages on the right and the Turkana scrub all around. Down the slope from the research building and classroom are the staff quarters where the cooks and mechanics for the institute live along with the excavation crew. 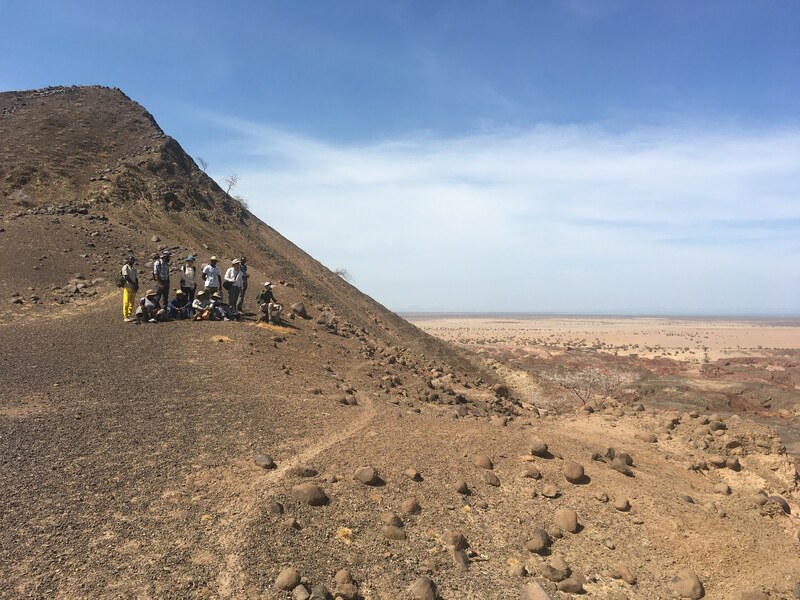 The crew comes in from their field camp on the outcrop for a night or two to take a break during their months of searching for the next monumental Turkana Basin find. 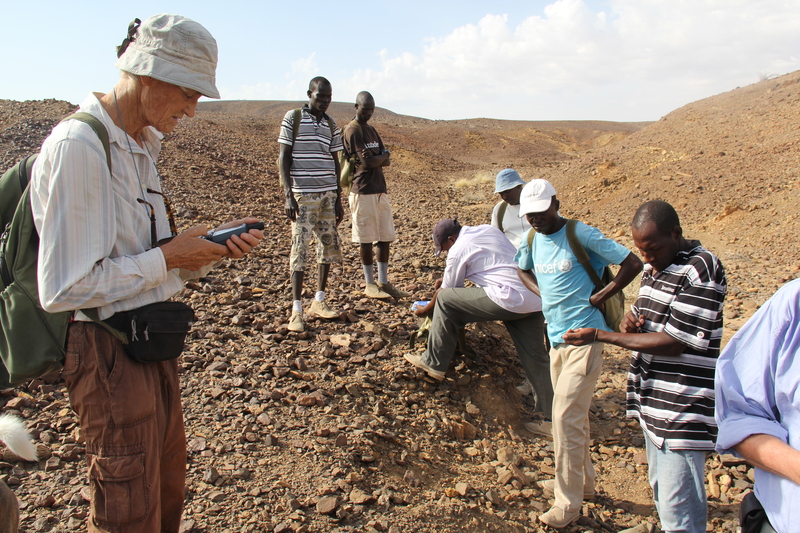 Maeve Leakey and the excavation team out on newly explored outcrop near the Napudet Hills. A few weeks ago, a soccer ball arrived in camp (or “football” depending on which side of the pond you’re from) and Acacia orchestrated a match between the staff and students. 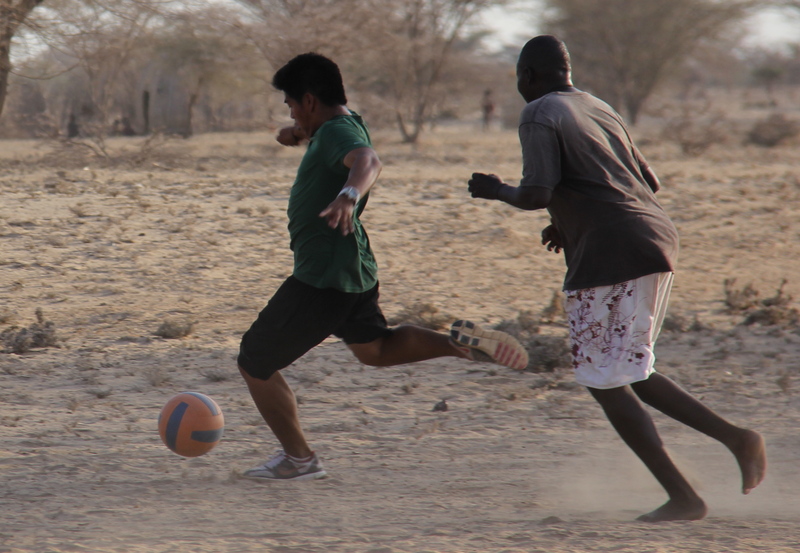 The Sunday soccer game has become a fixture of the off-day routine with the excavation crew members and institute staff facing off against a field school team. 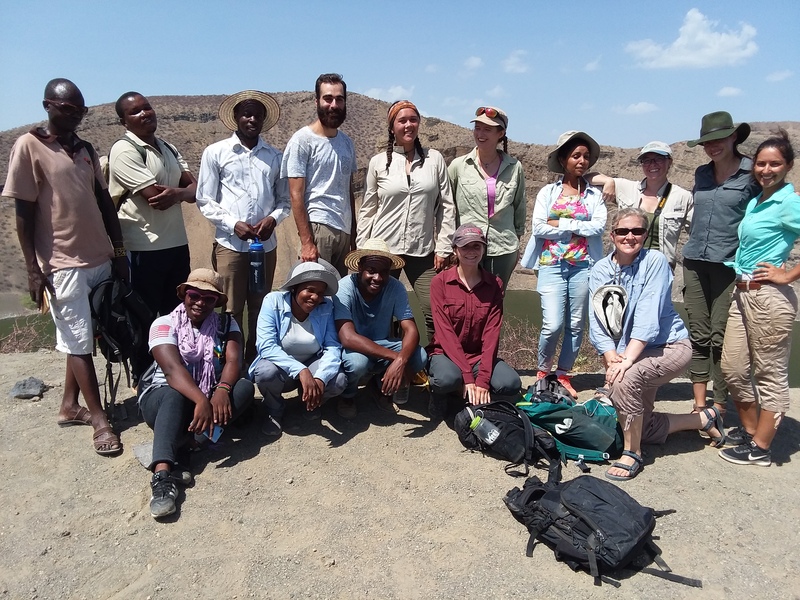 We walk out about a kilometer from camp to a field that has been cleared of Indigofera thorns. The goals are mounds of sand marked with sandals or water bottles. The field is close to the center of the small village near South Turkwel, and children and some villagers come to the field to watch the match and occasionally contribute a kick or two. The Field School pre-game huddle. This is the last chance to catch our breath before the game begins. The footballers from left to right: Matt, Cory, Rob, John, Leanna, Holly, Ingrid, Maegan, and Meg. One of the excavation crew members drives towards the field school goal. John gets under the ball and sends it downfield. John and Matt tracking the ball down the field. Rob takes a shot on goal. Dr. Matt Skinner, our human evolution professor, set up a solid defense with Francis. Here he clears the field school end with a massive kick. Cory takes the pass and commands the ball. After the kick off, we go until the sun sets. 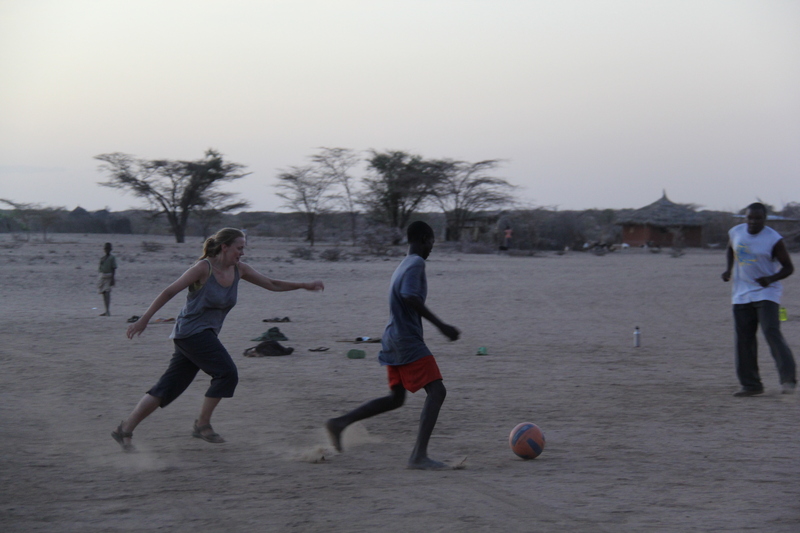 None of the field school students play soccer regularly at home, but in the sands of Turkana we’ve rekindled latent soccer skills from high school teams (Sam and Holly), elementary school rabble-ball (me, Natalie), or skills just born of competitive enthusiasm (Rob, Meg, Ingrid, Cory). 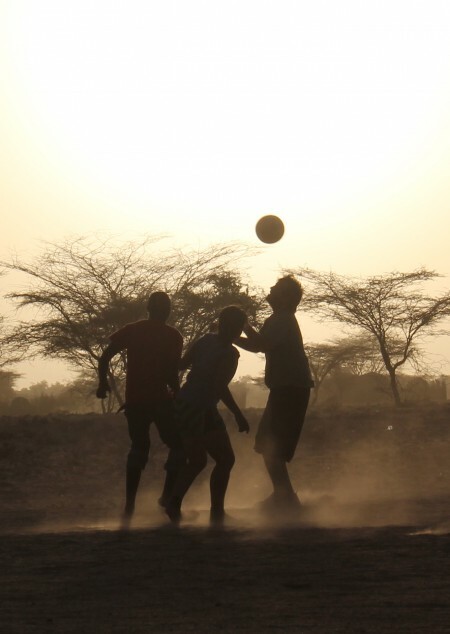 Each game is played at full tilt with the Kenyans and Americans+Canadians+Kenyans never slowing for a water break or to let the dust settle. Matt slides into the ball with a little karate kid action for good measure. 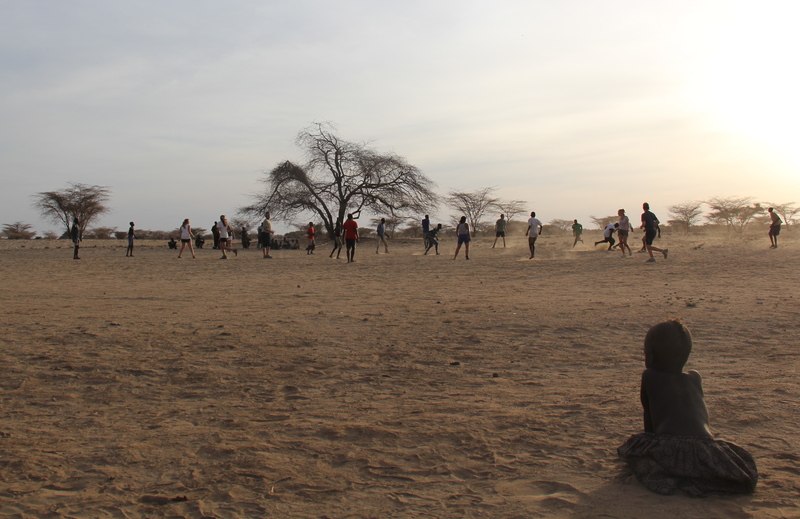 Our youngest spectator watches the tired mob out on the South Turkwel pitch. Holly drifts with the ball. Keeping control of the ball in bare feet involves a lot of fancy foot and toe work. Sam watches the action near the staff's goal as the sun sets and the final minutes of exhaustive play tick away. Kids from the village lead the way back to TBI after another exciting match. Eve has discovered a new interest in sports photography and beautifully documents each match as we stampede up and down the field. Meg takes off after a forward lining up his shot on goal. Natalie and John clear the ball downfield. 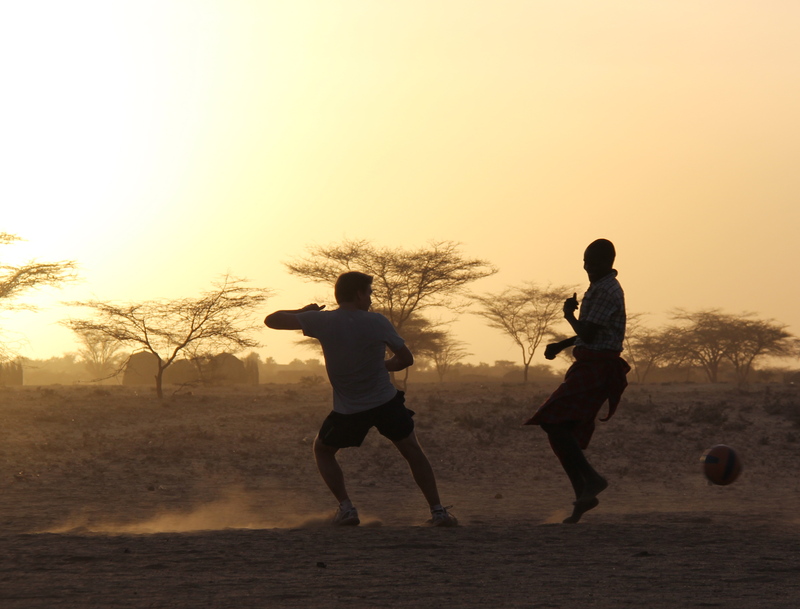 A villager joins the chase and demonstrates the incredible ability to run and kick in a hand-wrapped kikoi. 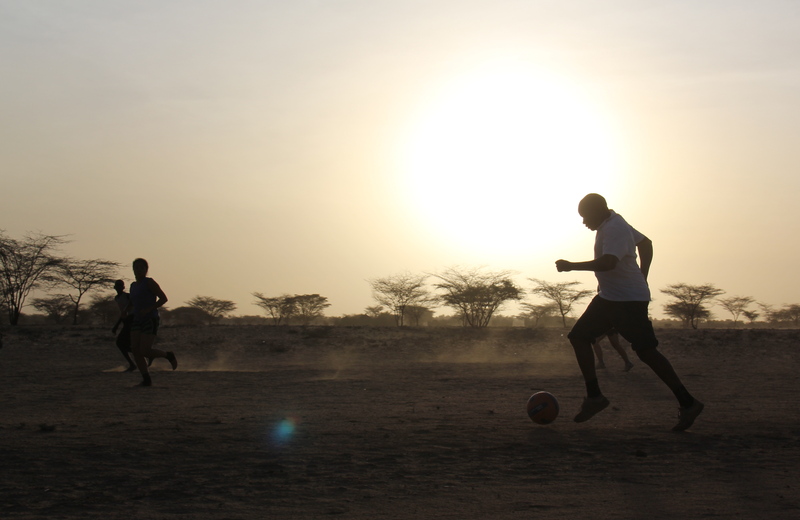 Footballers Club (FC) Turkana Basin. The game usually follows on the heels of a Sunday excursion. It may be our day off, but most students don’t want to miss out on a chance to explore the area. 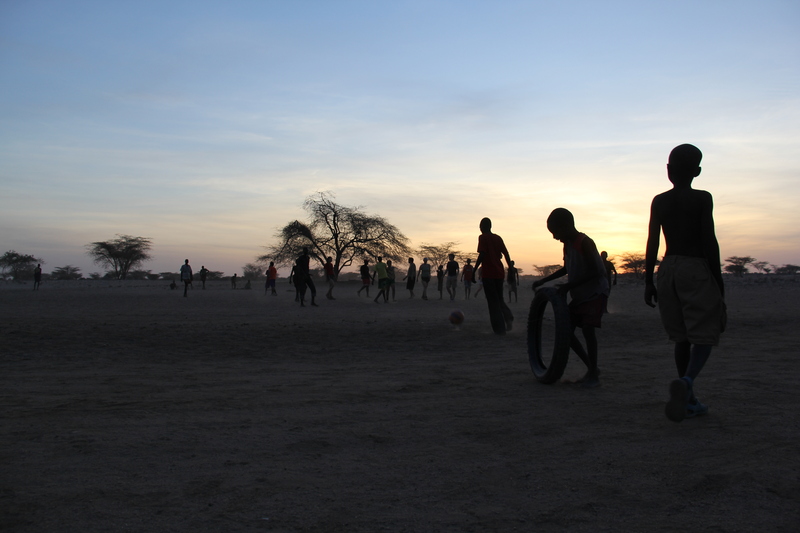 We’ve taken two trips into Lodwar, a true frontier town sitting on the edge of the no man’s land close to the northern Kenyan border. Lodwar is a prime source for toiletry necessities like shampoo, toothpaste, and super glue as well as creature comforts like chocolate, salty snacks, and large sheets of colorful fabric called kikois that can be used as waist and body wraps. 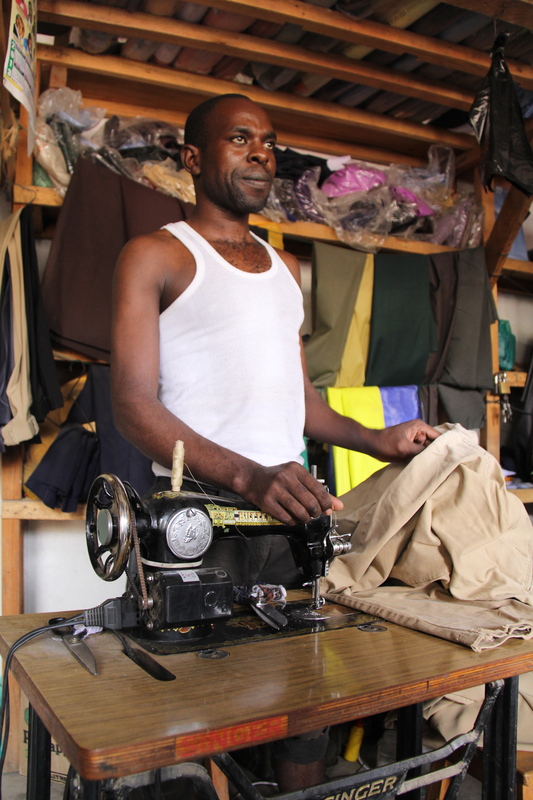 A tailor in Lodwar uses a treadle Singer sewing machine to patch up Tim's field pants so they can live to fight another day. 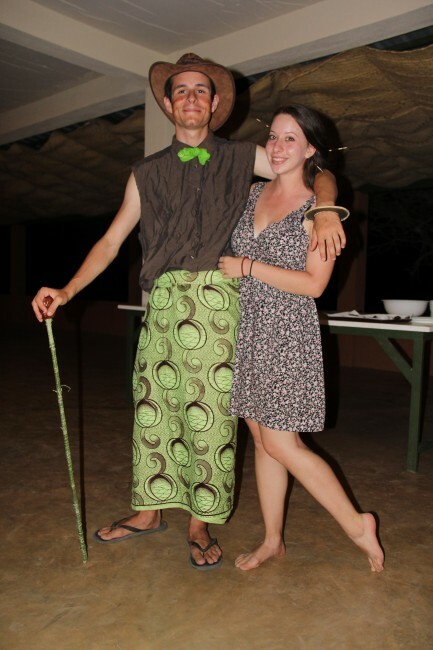 Kikois are now favorite evening attire, and over the weekend became formal wear for the first Field School prom (hunter-gatherer themed). The Saturday night festivities were a way to celebrate the completion of final exams and project presentations for vertebrate paleontology before moving into our final two weeks and our final module. The men of TBI class it up for prom. Everyone opted for the bandana tie. Aaron (center) made a doum palm cane and sports a Turkana wrist knife. Tim (left) brought out the suspenders for the occasion and shared with Rob (second from left) who created the formal kikoi ensemble. 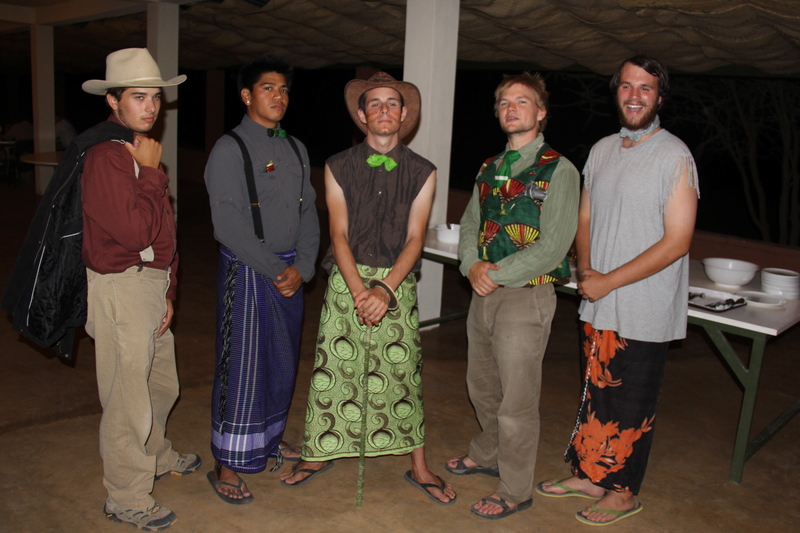 Matt (second from the right) went for the kikoi vest and duct tape boutonniere look while John (right) went with the slicked over hair, twirled mustache and tasseled t-shirt. Classy gents. Holly, Ana, Bailey, Eve, and Tim pose for a mid-prom group shot. Aaron and Rachel pose for their prom portrait. Rachel has porcupine quills keeping her hair up. 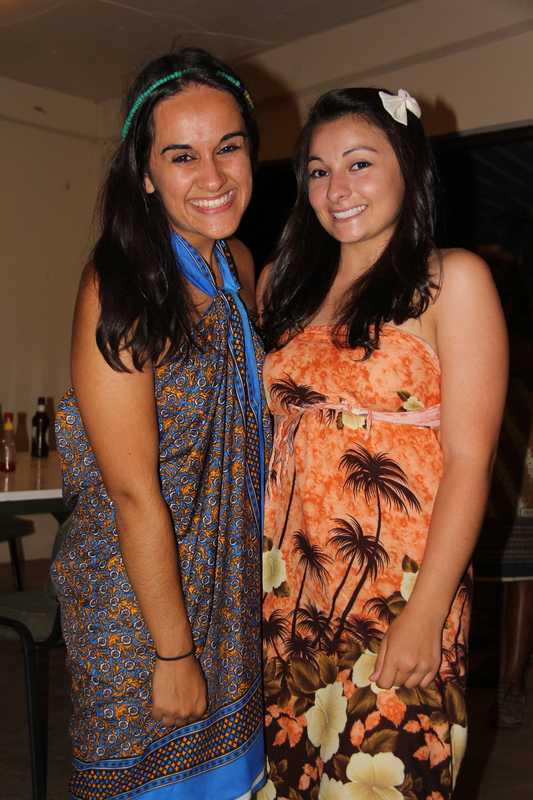 They were the best dressed couple at the party. Eve and Maegan in their kikoi prom dresses. 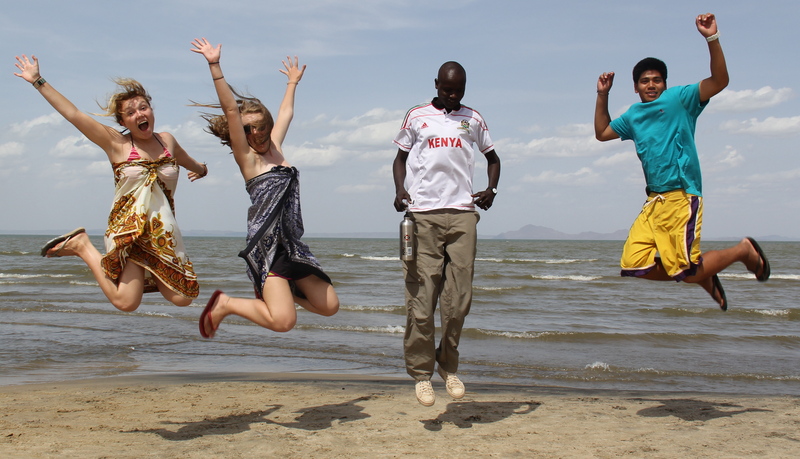 Two trips have also been taken to Elyie Springs, a small “resort” on the shores of Lake Turkana. We pile into the truck and drive the hour east to the lake where we can set up along the beach or just soak in the Jade Sea. A brutal sun on our first execution to the Spring taught us all to regularly reapply sunscreen while reading another chapter or listening to music on dusty iPods. Leaving the beach involves running the gauntlet through local women who have appeared to sell their wares such as necklaces, Turkana wrist knives, and woven baskets. It’s a slow tourist season, so things can get a little claustrophobic on the way back to the truck. During the week, the students work hard on their course material. When you’re surrounded by the rugged landscape, rich with material waiting to be discovered, it’s hard to become too unfocused. Everyone seems to be leaning into new topics and questions, even if they’re far removed from expressed academic interests. But, that doesn’t mean there isn’t time to take a few swings at a doum palm nut, boot the soccer ball, polish off a novel, stare up at the spectacular night sky, or play a few rounds of euchre or rummy. 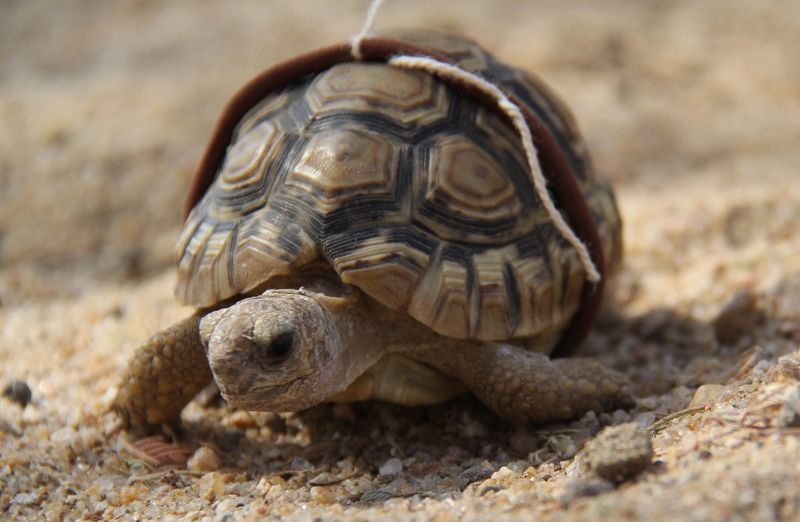 Acacia rescued Chi Chi the leopard tortoise from some heckling kids in Lodwar. The tiny reptile has been adopted as the dormitory mascot. Eve is taking the speed demon for a walk around the compound. Chi chi ready for her close-up. Working hard and playing hard (or resting hard). 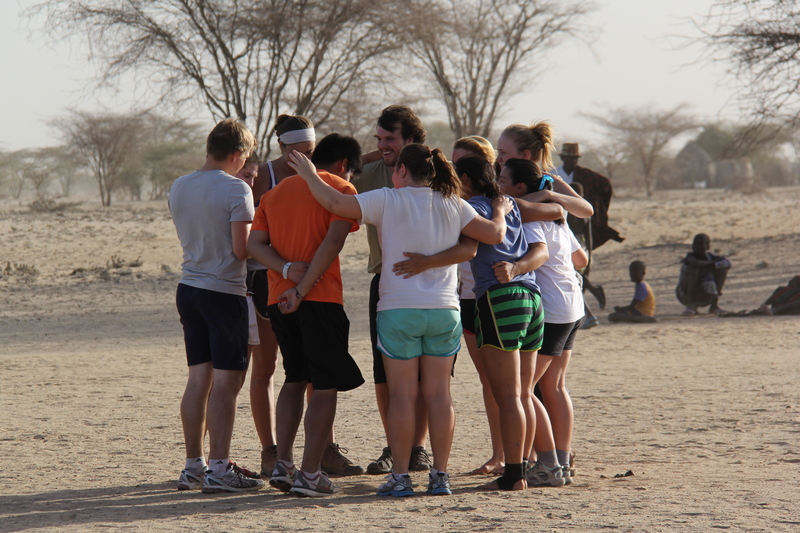 It’s all part of a day in the life of a Turkana Basin student. 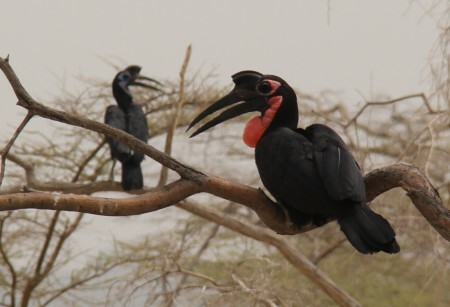 Abbyssinian ground hornbills in camp. This pair loves to explore the empty cottages. You can't tell from the image, but they're turkey-sized animals. The TBI grounds are a birders paradise. P.S. If you are a prospective field school student or have been accepted, but have questions about the daily grind (I know I barely scratched the surface here), please feel free to get in contact with me (contact information at the Stony Brook Anatomy Department website) and I can put you in contact with former field schoolers to help you sort out what to expect. Abyssinian Ground Hornbill taking off over camp. His wingspan is about six feet from tip to tip. Just part of the backdrop of the incredible TBI experience.